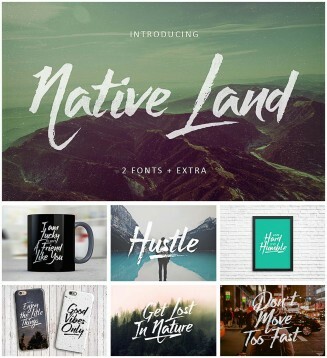 Introducing Native Land is a set of 2 hand-made brush fonts, designed to combine perfectly and allow you for creating masterful typographic designs.Will be perfect for logos, printed quotes, cards, labels, product packaging, headers and whatever your imagination. File format: .otf, .ttf,.ai for Photoshop or other vector software. Tags: bold, brush, cursive, drawn, graffiti, hipster, paint, swash, urban.